From the 31 of July to the 5 of August we celebrate the Big Week of Piragües in Ribadesella. We will have activities for the little ones, party, fun and, of course, the LXXXII International Descent of the Sella. Saturday August 4 at 12 in the morning the LXXXII International Descent of the Sella between Arriondas and Ribadesella. As in previous years, the City Council of Parres offers a camping area, the Concordia Park, It will open its doors to the 2 in the afternoon on Thursday 4 day in August and will close on Sunday at noon. Also, as usual, it will be free. · Thursday 2 and Friday 3 from 11 to 20 hours. · 4 Saturday of 08: 30 to 20 hours. · 5 08 Sunday: 30 to 13 hours. This year the only camping area will be Prau San Juan. The camp opens on Wednesday 1 day of August at 8 in the afternoon. 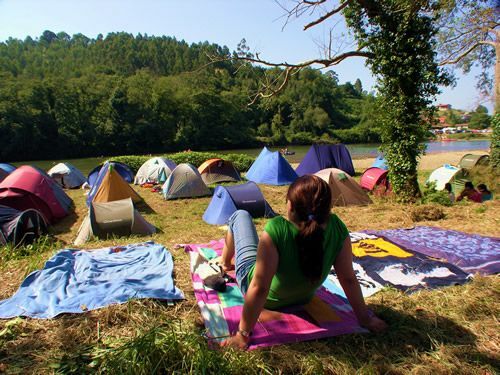 The fee for camping is 20 euros per person plus 10 € per vehicle. Those who do so starting at eight o'clock on Saturday morning 4 in August will pay 10 euros per stay and 5 € per vehicle. There will also be free parking areas duly marked on the AS-263, the exit road to Llanes. They will have a free public transport service that will link them with the urban center of the village, which will be operational on Friday and Saturday of 17: 00 to 23: 30 hours. 9 Sunday: 30 to 12: 00 hours. 1 Observe the logical rules of coexistence and public order. 2 Collect all kinds of waste in closed bags, depositing them in the containers that are installed for this purpose. 3 Adopt the necessary precautions for the security of your belongings and values. Ribadesella City Council is not responsible for robberies, theft or damage of any kind that may be victims campers and their belongings. Neither will be responsible for damages caused by fires caused by the campers themselves or their belongings, atmospheric incidents or any other cause outside the Organization. 4 Follow the instructions of the Organization's staff at all times. 5 Leave the controlled camping area, with all the equipment, before closing it. 1 Ignite any kind of fire, as well as the use of gas stoves or barbecues. 2 Use amplified music equipment. 3 Disrupt the rest of the other campers, with behaviors that alter normal coexistence. 4 Practice games or sports that can be dangerous or disturb others. 5 Introduce animals that have not been authorized. 6 Leave waste outside the containers intended for it. 7 Install fences, fences or awnings, as well as any other element for which no prior authorization has been obtained. 8 Carry out any kind of acts that may damage or damage the property, hygiene or appearance of the controlled camping area. In the villa will be created children's leisure space along the Letizia Promenade and in the posterior square of the brotherhood "so that the youngest also enjoy the canoes". I want to do the "Descent of the Sella"